Lee Williams nickname 'Shot' came from his mother, who called him 'Big Shot' as young Lee liked to dress up in fancy clothes at any opportunity. 'Shot' was born and raised in Mississippi, and moved north (first to Detroit, then to Chicago) for a career as a blues musician. 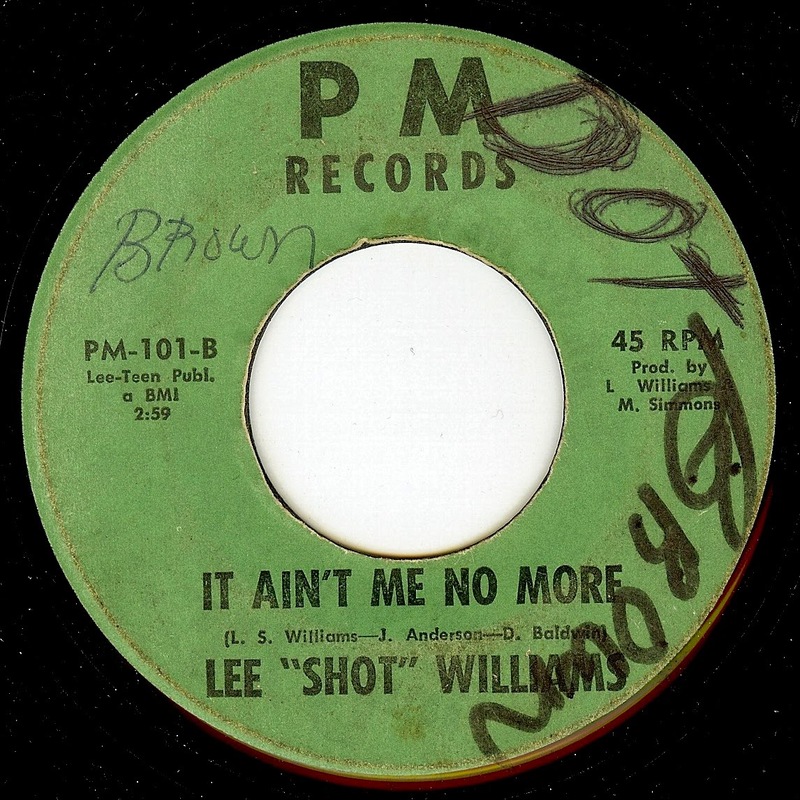 This track, while not a blues number, showcases Lee's vocals in a raw, deep soul setting that works perfectly for the man's style. Also, check out my tribute to the recently departed Deon Jackson here. 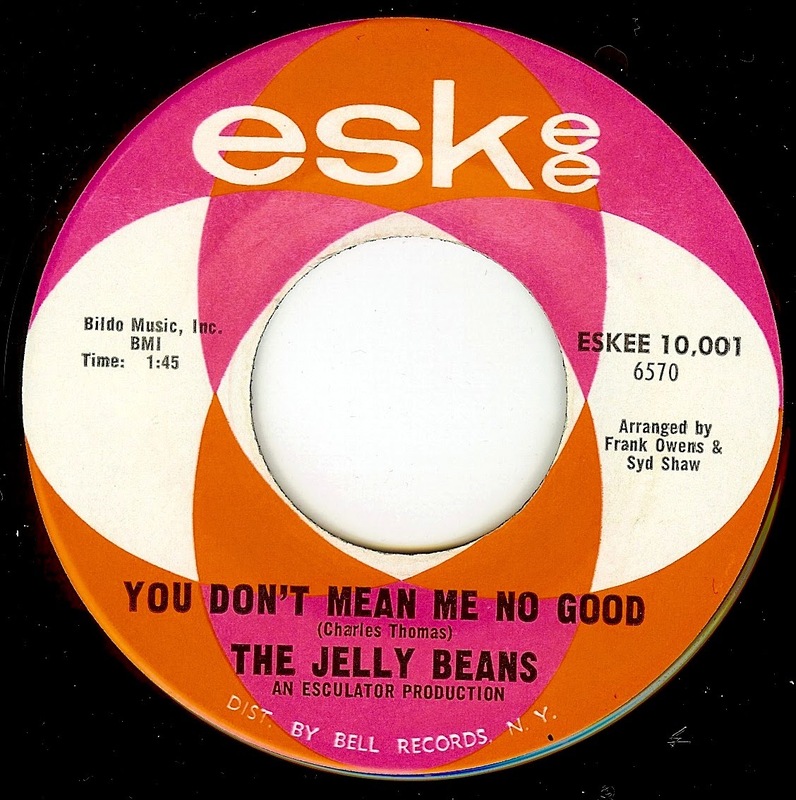 The Jelly Beans scored a massive hit (US Top 10) with their debut release ('I Wanna Love Him So Bad'), but it proved to be their only successful release in a scant three single discography. This (final) release from the group found them exploring more depth to their sound with a harder soul edge; one side being an uptempo stomper, and the flip being a brilliant soul ballad. Sadly, this single failed completely and is very, very scarce. While the northern soul favored 'You Don't Mean No Good' was the side that initially drew me to seek out this record (dig those infectious handclaps and the attitude laden backing vocals! ), 'I'm Hip To You' was a very pleasant surprise to me on first listen, and I would rate it as perhaps the greatest thing the group ever cut. The mood, arrangement, vocals, and the song itself are top notch; it has the type of dreamy qualities that are favored by the Lowrider/ underground oldies crowd as well. The story of the Jelly Beans is a familiar one in the annals of girl group lore; high school friends (in this case 4 young ladies and one young man) formed a group which was 'discovered' and signed by legendary songwriters Leiber-Stoller to their newly formed Red Bird label. The combination of New York producer (and Sue Records label owner) Juggy Murray and vocalist Justine 'Baby' Washington was one of pure musical chemistry; Juggy placed Baby's husky, intense vocals inside productions that showcased the strength of her voice in the perfect setting. 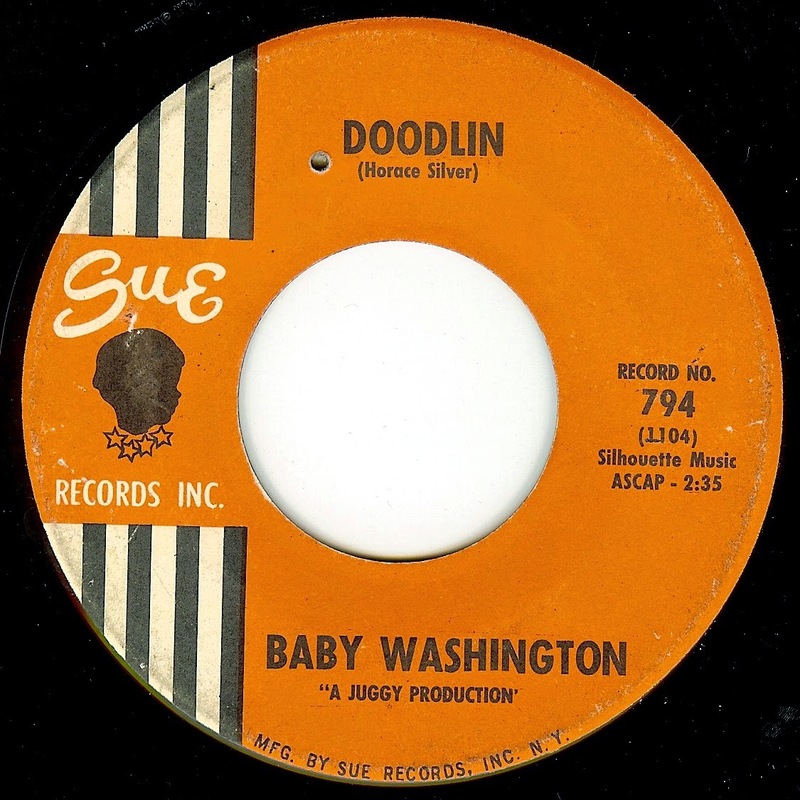 'Doodlin' is a track that was written by the great jazz pianist Horace Silver, and while the original recording from 1954 (Horace Silver and The Jazz Messengers) is a relatively straight (but swingin') hard bop performance, this reworking takes on the Latin style rhythms that Horace Silver was also exploring in his music during the 1960's to brilliant effect. While the original is an instrumental, lyrics are added here; strangely, though, the lyricist isn't credited (it may very well have been Baby herself). The end result is a unique vocal melody with jazzy phrasing and a phenomenal performance from everyone on the track. Possessing an incredible, earth voice, Justine's "Baby" Washington's professional music career began in 1956 when she was all of 16 years old as a member of New York City group The Hearts. By 1959, she was recording as a solo artist. Justine continues to sing to this day, performing occasionally on the east coast. Sadly, she was working on tracks with producer Juggy Murray (of Sue Records fame) who was quoted as saying he would "rather record Baby Washington than eat" when Juggy died in 2005. 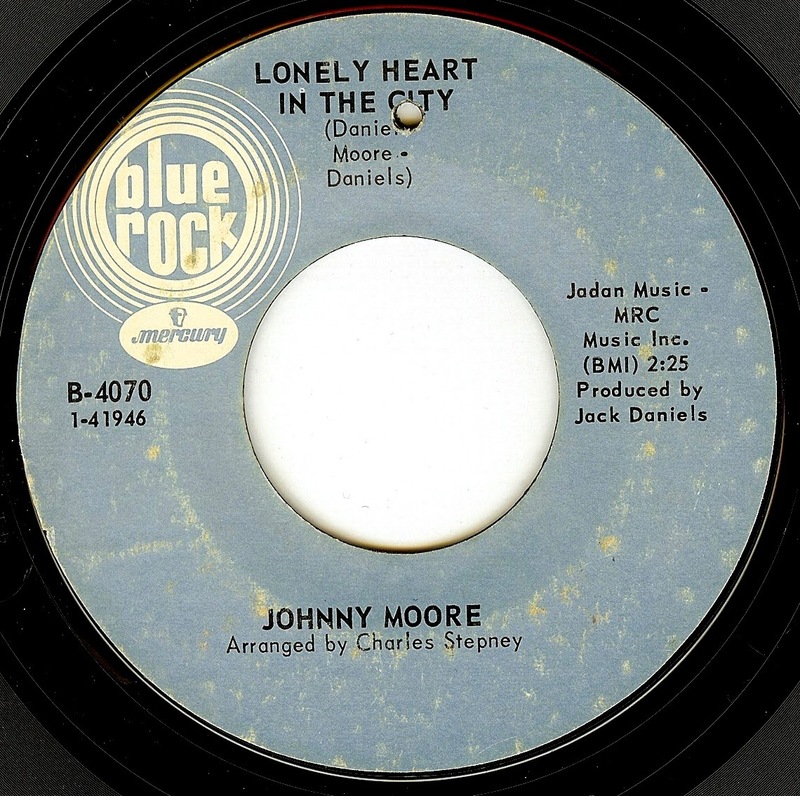 'Lonely Heart In The City' is one of those records that commands attention from the very first revolution per minute- the band lays down a swirling intro, a killer guitar hook sets the mood, and a simple but incredibly effective female vocalist duo sings the title in a way that shows that this record means business. Johnny Moore delivers the vocal with pure soul, and just when it seems that this record is a relatively straight (but deeply grooving) soul-blues, the bridge comes in, shifts the mood, and propels the song upward in a bit of masterful song craft. Chicago based producer/ songwriter Jack Daniels was involved in several cool records, but the majority of them seem a bit half baked and not up to their full potential. However, this one is fully realized and one of THE great Chicago soul tracks of the late '60's. Chicago vocalist Johnny Moore had a powerful, appealing voice and released several great records. For whatever reason, his records charted locally in Chi-town but never made a mark in any other markets. No surprise that when several of his sides were compiled onto CD that the title of this record was used as the name of the compilation.